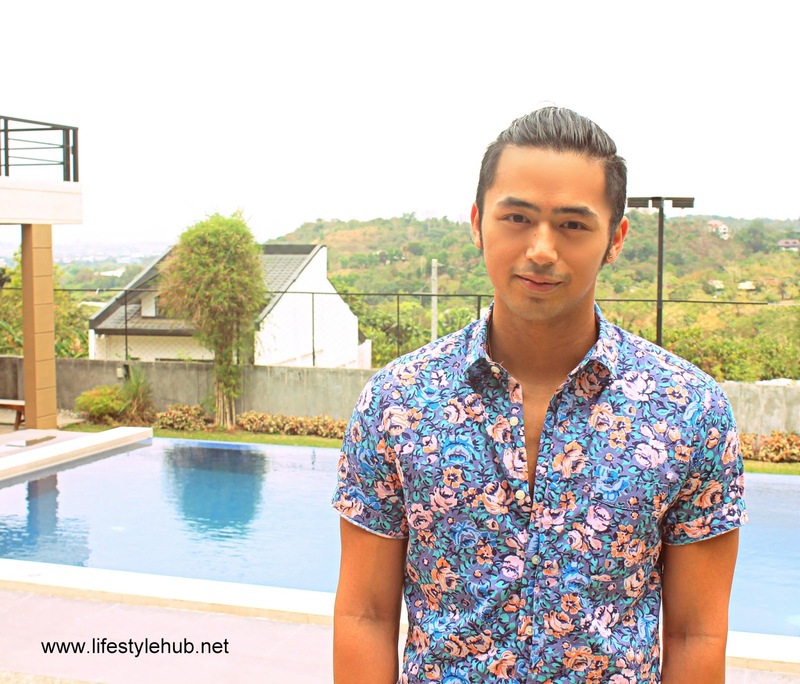 "Alam ko nga lagi ako nandun eh... " Enzo Pineda says with a laugh when I asked him about how he handles blind items. He was referring to a local showbiz blogsite which publishes daily blind items sent to the blogger by various sources. You'd expect Enzo to be emotional but as happy as our background during the interview (we were in a private guest house in Taytay, Rizal with a sparkling swimming pool), the Starstruck Season V First Prince spoke as relaxed as he can. "Most of the issues are di totoo or parang I don't know... Well, at least they're talking about me rather than not," he went on. Enzo also said, "I think it wouldn't be a blind item if it was true. It makes sense." The "art of dedma", as most celebrities call it, is obviously taking a huge part on Enzo's showbiz survival. Being in the industry for five years, the 24-year old actor is taking rumors and gossips lightly. Why couldn't he? From the moment he became a finalist of Starstruck's fifth season, which are credited by some to his family's close ties with prominent people in the entertainment circle, he already has his dose of the harshest controversies. But among all the news items, there's one subject which declines to give Enzo a smooth-sailing run in showbiz: the issue on his sexuality. Why do people always question his sexual preference and orientation? "Maybe there's like a fantasy," he declared. "Before, parang madami. Ngayon nga bawas na eh pero I don't mind naman." "But Enzo, once and for all, is this gay issue true?" I interrupted the actor who still remained calm despite the sensitive topic. "No... It's not. I mean, I have had girlfriends," he said politely. "But Enzo, once and for all, is this gay issue true?" I interrupted the actor who still remained calm despite the sensitive topic. "No... It's not. I mean, I have had girlfriends," he said politely. Pictured with Enzo Pineda here is fellow Kapuso hunk and new GMA Artis Center talent Vince Velasco. Looking forward to more positive things in his career, Enzo is switching from teeny-bopper materials to a more mature personality. With his longer hair tied and pushed back and a floral summer, short-sleeved polo left half open, Enzo looked ready to say goodbye to wholesome. More underwear moments with Bench are coming ahead! Fresh from the success of his primetime soap "More Than Words" with Janine Gutierrez and Elmo Magalona, Enzo also don't take gossips personally. "I have nothing against, like ah... gay people or the ones who are writing kasi it's part of our industry. They're very creative people. Wag na lang patulan," he said. To those who are still pressing that the young actor is just denying, Enzo adds: "Sa mga ganyan, lalabas at lalabas naman ang totoo. Ayokong nagpapaka-plastic. Kung tama yung news or something about me, accept it. I'm very honest with myself. Kung ano yung pinapakita ko sa tao, yun na." But is her current girlfriend bothered? "Di naman," Enzo assured. Insiders say, however, that Enzo's new non-showbiz relationship happened so fast. Is this part of a packaging and to make all the rumors go? "It's falling in love. I never really expected to be in a relationship after a year. It's not because I just want a relationship because I just want the feeling of love. Nakita ko talaga sa person that I am with right now na very genuine, very sincere. I am not saying that sa previous relationship ko, I didn't see the same. Nakita ko sa kanya na magja-jive kami," he responded. "I honestly took my time. The ligaw was 6 months. I just kept things private," he added. Looking forward to more positive things in his career, Enzo is switching from teeny-bopper materials to a more mature personality. With his longer hair tied and pushed back and a floral summer, short-sleeved polo left half open, Enzo looked ready to say goodbye to wholesome. He is posing anew for a Bench underwear campaign which should surprise you when you visit Bench shops soon. "I'm ready for bigger roles and more surprises. I am so excited to explore." The good-looking Kapuso guests who joined the bloggers at the Artist Center Bloggers' Summer Party: Vince Velasco, Enzo Pineda and Juancho Trivino.